I look out of the window, battling the forest chill as we ascend gradually towards Kodaikanal. My hand now freezing as I try to capture the mesmerising winding curves in all futility. At every turn, the scene darkens and the forest appears more mysterious than ever. I refuse to shut the window, to see the trees whizz by, standing tall, like sentinels of the valley, dotted on the fringes of the mountains. We drive past tiny waterfalls gushing down on either side of the road, in perfect symphony with the moss clad tree trunks and branches hanging low. The temperature dips, but the window is still not shut: the forest fragrances cannot be missed. Neither can the burst of colour outside: flowers of every hue adorning the creepers, gleam like stars in the green, protruding outwards, as if eager to welcome you to the deepest secrets of the forests. Purple, orange, red, yellow, magenta and pink! And within seconds, it is all covered with mist. Kodaikanal, the gift of the forest opened up to us in many ways. The trip was with Doreen, so it had to be off the beaten path. The detox that it was, had everything: idyllic wooden cottages, huggable trees, fresh air, scents of Eucalyptus, chance forest finds, walks in wilderness and eating local produce. When we checked into Lilly’s valley resort, it was hard to not fall in love with it’s outdoor ambience. Dainty creepers camouflaging the colonial styled stone cottages and tiny birds hidden in the foliage. It was further away from the main town( and the noise) and if it was glorious during twilight when I first saw it, I knew it wouldn’t be any less enchanting in the morning. And when dewdrops blossomed stealthily over it’s grassy lawns at dawn, I was up, watching the sun glide over the sky. Mornings at Lilly’s were nothing short of magic. Streaks of the winter sun flashed through the trees and creepers as I embarked upon a nature trail within the resort premises. Early morning walks are always rewarding. From witnessing the passion fruit flower bloom to seeing branches full of peach blossoms glisten in the sun. All this in pin drop silence only to be punctuated with the call of the birds and sounds of laughter from the Gazebo where piping hot idlis and dosas accompany balmy conversations and warmer company. It almost felt like a scene out of Enid Blyton’s Famous Five adventures. Mist rolled amidst the Eucalyptus trees make it all the more dramatic. We hopped off to catch a glimpse of the silent valley from atop a watch tower and within a matter of seconds, the valley decided to wrap itself snuggly with a cover of mist. It gave a glimpse of the valley though, that is silent because there are no cicadas in the forests. While forests are essentially about the song of the cicadas, I wonder what would it be to visit a silent forest. As we walked right into the mist, the frames of the trees like silhouettes, I was filling my lungs with the eucalyptus scented air. How often do you get to traverse down a natural perfumery? As the crows swelled in Kodaikanal, we chose to drive away from them to Mannavannur lake. A clear day, with clouds proudly gloating in the skies: perfect for photography. The drive was through pine forests: gargantuan coniferous trees reaching out to the sun and sunlight playing hide and seek through them. As the tree cover gradually disappeared, meadows took over. Terraced fields appeared like a patched quilt, spreading over the plunging valleys. This is when we spotted a tiny glimpse of the Mannavannur lake surrounded by unending pastures and rolling meadows. For a second it felt like Ireland, (I haven’t been there) but it just did. No, it was Tamil Nadu but the sight was pleasing to the eyes. Simple, serene and so picturesque: this is how i’s describe the walk to the lake. Green grass, blue skies, a lilting breeze and occasional logs of wood scattered across the meadows for people to sit on. It was hardly crowded, barring a few butterflies and buffaloes who swam to and fro in the lake. I could sit on that log the entire day soaking up the winter sun. How does one capture the grandeur of a forest in a frame? No. I shake my head. It is something I have been trying to do ever since me and the forests met and cupid struck. I try panorama, I try different angles and when I think I have got the perfect frame, I sigh, it feels like it is just a piece of jigsaw: incomplete. The drive to Berijam lake overlooked the medicinal forest, the Berijam lake view point and thick pine forests. But nothing came close to the walk to Berijam lake. Chirping trees surrounded the lake in abundance with umpteen pine cones strewn across the path. The lakeside is leech infested so we were advised to keep off the damp areas. The waters of the Berijam lake were placid with clusters of white lilies floating like stars.Christmas came early, with pine cones, chirpine trees and finding the velvet soft Eucalyptus flower. 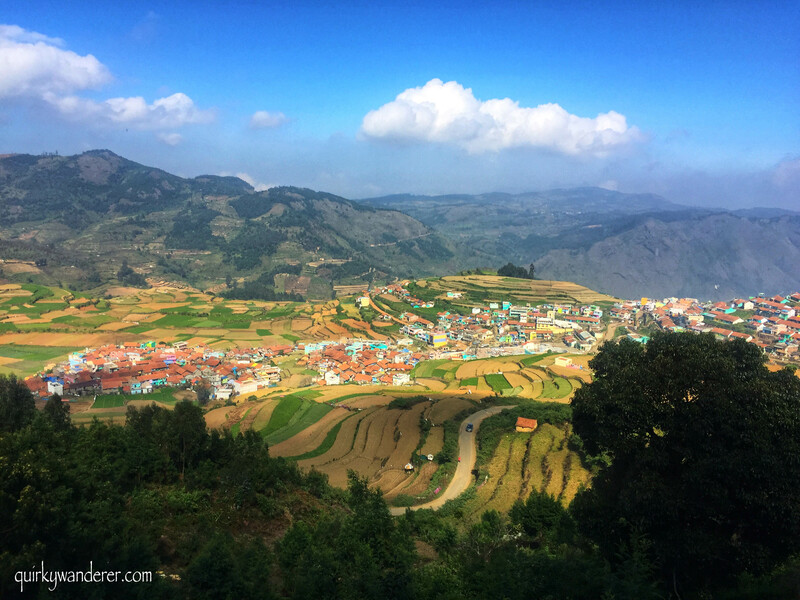 Kodaikanal’s colonial history , it’s British influence and the advent of American missionaries led to a number of churches being built in this hill station. It was the summer detaination of the British officers in Chennai. I visited the Christ the King church and the La Salatte church in Kodaikanal. While La Salatte had a blend of Anglo – Tamil architecture, Christ the king had a gothic feel. Both of them had classic, stained glass windows. What are hill stations without their iconic colonial feel? An evening stroll on the Coaker’s walk: A 1 km stroll with a valley view (if there isn’t any mist). Shopping therapy: At every bend you will be wooed by shopkeepers to buy local homemade chocolates( you taste before buying) , aromatherapy and Eucalyptus oils, local spices: cardamom, pepper, clove and the likes. A special mention for Kodai Handmade cheese: though you cannot see the process of cheese being made( visitors aren’t permitted inside the factory), you can buy a variety of gourmet cheese from the Kodai cheese outlet. They have cheddar, goat cheese, Feta, Gruyere and many more. These are made with veg rennet and hence ideal for vegetarians! Botanical gardens: if you wish to indulge in some colourful flower therapy, take a leisurely stroll in the Botanical gardens to see an array of flowers displayed elegantly. If you want an offbeat stay option, with great hospitality, Lilly’s Valley resort is an amazing option, away from the main town. It has wooden cottages, plenty of green spaces and a staff that takes care of minute details! While the meals at Lilly’s are sumptuous, try Sanjay Lunch Home for local , homely cuisine at least once and have local fare on a banana leaf. The princess of the hills primarily has Shola forests which are endemic to Southern India. The trees found here are the exotic species of Eucalyptus ( it isn’t endemic), Indian mahogany, jamun, magnolia, Nilgiri Rhododendrons, Bishopwood, pines, gum trees and a spread of wattle. Mammals found are the Indian Gaur, Nilgiri Tahrs, grizzled giant squirrel, barking deer, Sambhar and bonnet Macaques. The region is known for its Kurunji flowers which bloom once in 12 years. The next flowering is slated for 2018! Splendid read! I hope to make it to Kodaikanal next year. Kodaikanal is a wonderful place. And the way you bring in for us makes it more enticing. Lovely account of your visit. I would definitely like to be there in 2018 when the Neelakurinji blooms. Thanks! 🙂 I sooo wish to see them bloom! From the word go…I was following you silently in awe, as you took me on a virtual tour of Kodaikanal – a hill station of which I have fond memories as a child! After reading this I don’t think I want to visit Kodai by myself, I want to go with you!! What offbeat trails you’ve been to! And where is the overwhelming humanity that you have managed to elude in all these captures? You sure this is Kodai wonly? Breath-taking views and the description takes the cake. I can sense your euphoria! 2018 we go on a trip together. Like a proper trip 🙂 Haha humanity was there, but honestly the forests had less of people, who preferred to huddle around the touristy lake! 😀 Yes yes this is Kodai only 🙂 Thanks for reading Kala 🙂 You always lift my mood! Thanks Divya, that was Pure Magic ! Only you can capture a place with pics, prose and poetry. Amazing read Divsi. And the pictures are simply stunning. How many days were you there for? This looks like it is out of a story book, indeed. You are spot on with that one. I thought of the Black Forest in Germany, where my mom was born, when seeing the mysterious fog and heavy forest above. So green and dense, like the woods out of the Brothers Grim fairy tales many kids know of. I love it. Places with heavy vegetation and the foggy, mystical feel are one of a kind. I could spend months in such a place, snapping photos and soaking up the stable vibe of nature. Loving your story telling ability! Your blog and fantastic photos make me yearn for Kodai again and again. Wow wow wow! Had no idea that conifers grew even in South India! I guess the forests make everything beautiful and your words just add a whole layer of yearning to the beauty. What blissful time you would’ve had! Been reading of this Kurunji flowers, the reference here just a reminder to check them out. Wonder if they belong to the Karvi family which blooms every 7 years. This looks gorgeous! I adore the views from the lake. You’re right, it does have some Irish qualities to it. What a perfect, peaceful retreat. Thanks for introducing me to a part of India completely different than what I would have imagined!